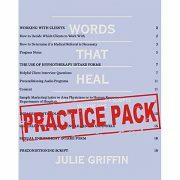 The newly revised and updated version of Recipes for Smoking Cessation by Julie Griffin is now available. Recipes for Smoking Cessation was specifically designed to help hypnotherapists super-charge their stop smoking programs. It contains ten valuable and effective hypnosis scripts which will benefit you no matter what type of smoking program you run. These hypnosis scripts will help your clients to pleasantly quit smoking—without stress and without weight gain—and it’s now better than ever!